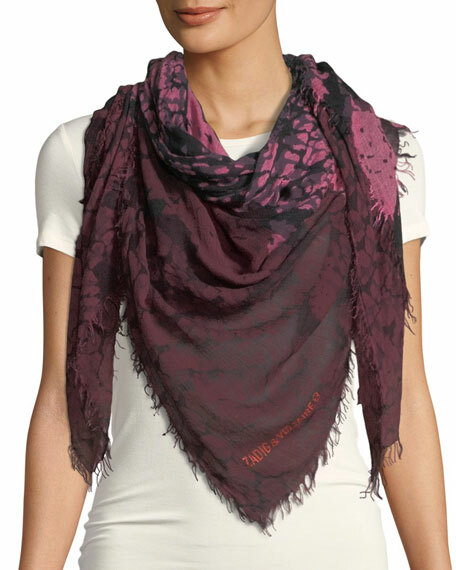 Zadig & Voltaire "Delta Wild" scarf. Approx. 55" x 59" (140 x 150cm). Zadig & Voltaire arrives in the U.S. by way of Paris, where it is known for its free spirit and a rock and roll edge. The collection features a smattering of studs, zippers, and leather, along with unexpected details like patchwork fur. Zadig & Voltaire calls out to the fashion maven who prefers her look to present as effortless and put together, but served with a side of grunge. For in-store inquiries, use sku #2545486.